Heat water to boiling in a 1 1/2-quart saucepan. Stir in barley; reduce heat to low. Cover and simmer 10 to 12 minutes or until tender. Let stand covered 5 minutes. Melt butter in 10-inch skillet over medium-high heat. Cook onion and garlic in butter about 2 minutes, stirring occasionally, until onion is crisp-tender. Stir in barley and remaining ingredients. Cook about 5 minutes, stirring occasionally, until thoroughly heated. Attitude is everything! Telling yourself that you have to exercise in order to lose weight takes the fun out of your workout. Instead, focus on positive outcomes: the extra energy you'll get from working out and the well-toned body you'll have—plus the healthy heart! Looking for an easy dinner recipe? 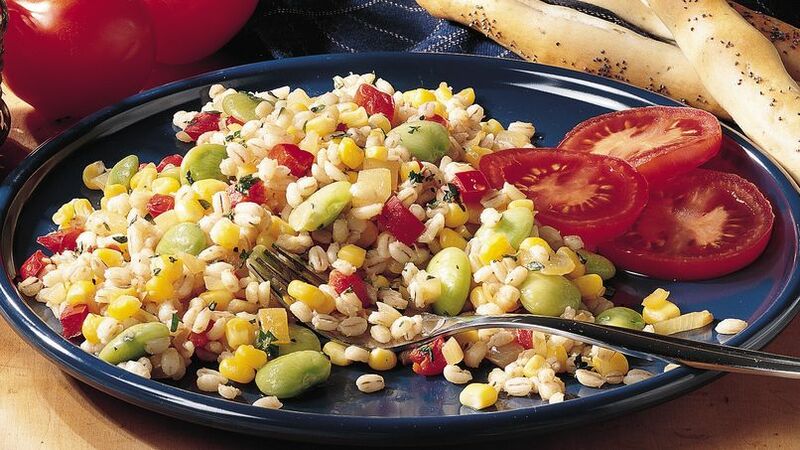 Then check out this barley, corn and bean dish that’s ready in just 30 minutes.